We love finding healthy grab-and-go snacks, so we were more than willing to give Corazonas© HEARTBAR™ a try. Their philosophy is that food should be both delicious and good for you, which we totally agree with! We tried each flavor to see if their claim to be tasty AND heart-healthy was true. 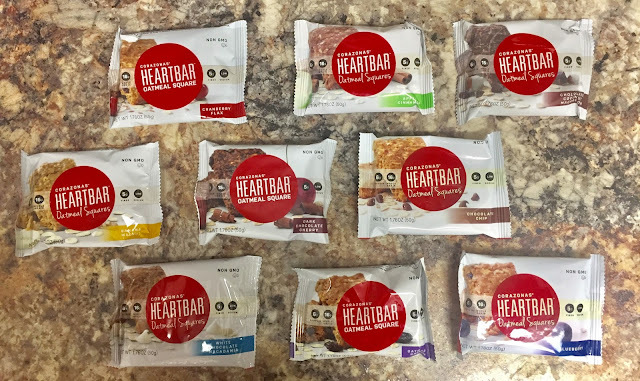 After trying all nine flavors, it's a pretty easy bet that there's something for anyone who appreciates a good oatmeal bar. Notably, these Heartbars have the ability to lower cholesterol, too. Win a Chance to Try Them for Yourself! For a limited time, the generous people of Corazonas are offering an EXCLUSIVE 10% OFF coupon code for online purchases. Just enter BLOGGER10 to receive your discount. Shop here and enjoy!